Read that NASA is going to launch on a previously-flown SpaceX booster. It's all coming together. The commercial entrants in the space flight business are helping their customers, including space agencies, get to space cheaper and faster. The full article at SpaceFlightNow says that Elon Musk's company will send a cargo ship to the International Space Station on a recycled Falcon 9 stage 1 rocket on Fri 8 Dec, mission CRS-13. The booster first flew on CRS-11 in Jun. Told Hristo I had not extracted the debug logs yet. But I verified I had the latest versions of Lunar Occ (1.1.0) and OcculTools (1.4.0). In fact, I had the correct versions installed before he sent the links. Shared the results of a quick experiment. I had renamed the two add-in DLLs and launched OW. They disappeared from the Add-ins menu, as expected. Then I installed the latest versions of the add-ins and re-launched OW. The Add-ins menu did not show them! I asked why would it not automatically detect them. Generated my Lunar X report for 2018. Doesn't look good. Only one chance in the new year... January. That's it. Well. Maybe two. The December will start in daylight. Diminished returns. 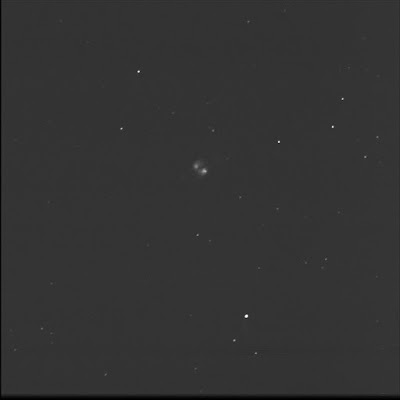 I asked the Burke-Gaffney Observatory to shoot M47 again but with a 1 second exposure. In hopes of split V378 A and B. They are about 5 arc-seconds apart. But B is magnitude 12. I don't see it. Luminance only, 1 second subexposures, 20 stacked shots. FITS Liberator, Paint.NET. North is up; east is left. First shot on 20 Dec '16. Then again on 12 Nov '17. Wow. I have viewed (and split) 1100 double stars! Could not find a proper bracket for big binos. Mounted alternate bracket backwards on tripod. Initially chose targets nearly straight up. Didn't dress properly so felt rather cold. And the binoculars dewed up. Was the Universe telling me something? Set up in the backyard. In the end, big binoculars on the big tripod. Big winter coat. The 8:00 PM slot said: cloud cover, 10, clear; transparency, 3, average; seeing, 3/5, average, with the Moon altitude at 46.5. Good To Stargaze showed low wind, high humidity, no clouds, good seeing and transparency. The temperature was to plummet. Considered V402 in Lacerta but it was almost overhead. 6:40 PM. Meteor southbound, out of the corner of my eye. 6:43. 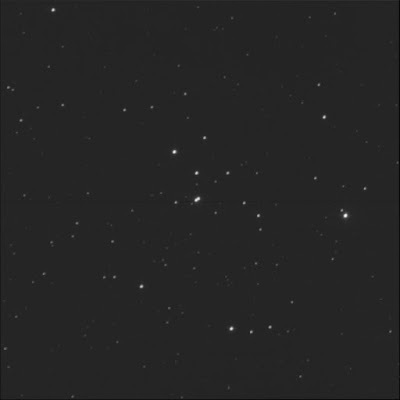 Was going for V640 Cassiopeiae. At β (beta) Cas I noted lots of tiny delicate doubles to the south. Some at 90 degrees to one another. All similar brightness and similar separations. 6:46. I checked ST3P for the details and wondered why it was on the list. This is a very tight pair at 1.6". That would be challenging at the best of times in a large instrument. It is a fast-mover at just over 100 years. It was nearly straight up. A neck-breaker. That made it even more challenging as I could not view it comfortably. 6:59. Could not split HD 13247 in Triangulum. Wider (at 11") but dimmer (mag 8 and 9). 7:04. Thought I was splitting 7 Persei. There seemed to be a faint companion at the 11 o'clock position. On subsequent viewing, I started to doubt it. I wondered about the mag limit of the Orion Little Giant II binoculars. Perhaps 11? 7:11. On 15 Tri. Got 'em! I was happy. Wide pair, 141.5". Mag 5½ and 7 stars. Pale orange. B is aquamarine. West was up for me. The colourful pair was on the end of a large inverted T-shape of stars, with HR 738. 7:18. No joy for ζ (zeta) Per. While the primary was bright, all the companions were very dim. Went inside to warm up. Said hello to Bree. Added some more targets to my observing list. My feet were cold in my regular boots. Weird. Put on the -100 set. 7:40. Found dew oculars of the binos, sadly, while the sky-facing objectives were fine. Was it my breath or body heat?. Brought a chemical hand warmer to clear the fog. 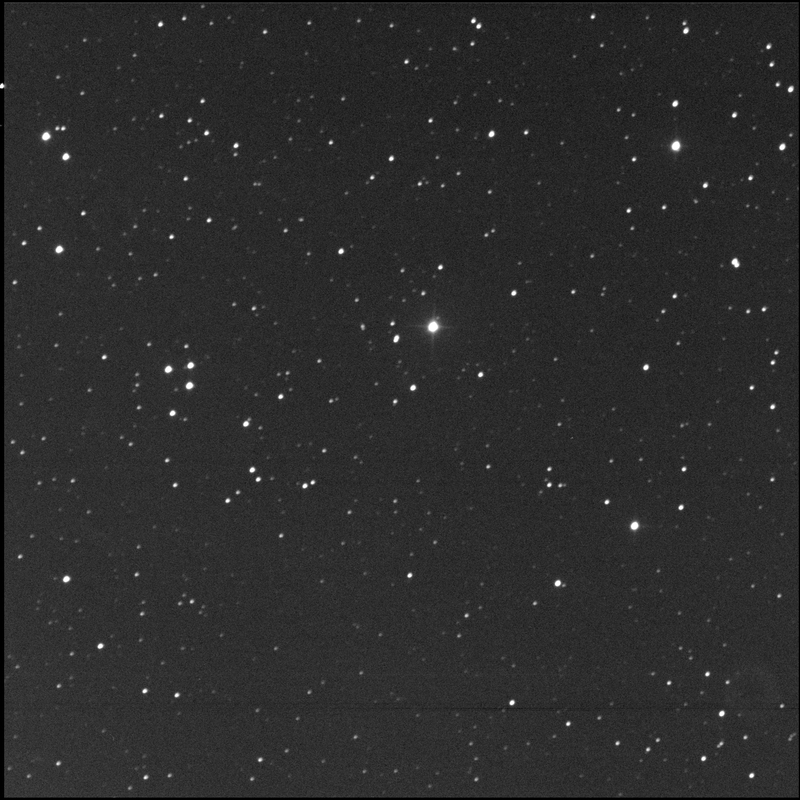 Viewed phi in Auriga. Nestled in a big flattened triangle of stars, including HR 1795. Rather cool system. Spotted the B, C, and D stars. They make a triad. B is to the east. C is to the south-east. D was the brightest to the north. C kept fading from view. Sometimes it would pop; sometimes I couldn't see it with averted vision. Very nice. Lovely field. Pulled some weather data. As of 8:29 PM at Environment Canada observed at the Toronto Buttonville Municipal Airport. Current Conditions 0°C. Condition: Clear. Pressure: 102.8 kPa. Temperature: -0.4°C. Dew point: -4.4°C. Humidity: 74%. Wind: N 5 km/h. Wind Chill: -2. The detailed forecast, issued at 3:30 PM for tonight said, "A few clouds. Wind northwest 20 km/h becoming light early this evening. Low minus 6." So, not a complete write-off. Got a couple more checked off the DS candidate list. That's good. Ran through the entire Occult Watcher set-up again. I deleted everything. I rebooted. Set up Occult. It is required for the Lunar Occultation add-in. And perhaps I'll use the Occult Tools add-in as well. Installed the app. Downloaded from the Occult page at IOTA (which referred to version 4.2.0). Used the hyperlink to download the occultinstaller.zip file. Followed the instructions for the manual set-up. Created a directory (natch, folder) on C's root. They suggested "occult 4." Unzip the files. The documentation said there would be 9 files. Hello, there's 11. That's not good. These days, with software threats, they should be precise. I created the shortcut on the desktop. I skipped the option to run as admin as I had not put the subfolder within the Program Files folder. Configured the app. Launched Occult. It made its subfolders. I let it download the two files for resources and sites. I saw my previously used settings (including dummy SMTP mail stuff) as when I had a configured it before. I downloaded the data again. This time I included the Tycho database. I briefly tested Occult. It seemed OK.
On to Occult Watcher. Tried to follow the instructions on the OW 4.5 "publish" page. It's confusing though with the hyperlink "Download" title which refers to a file called OWsetup.msi (and that's an old version of OW, 3.9). I ignore that and downloaded the OWupdate.zip file. This seemed correct as the install version was 4.5.0.2. This time I did not create the folder under Program Files (which I had done on my first attempt). As instructed, I ran the OWupdate.exe program as the administrator. Configured the app. It picked up my previous settings. So I changed nothing. Tried testing. The main listing generated OK. I activated the Lunar Occultations for Close Double Stars feed but it didn't seem to work. I checked the Add-ins menu. Tried to configure the Lunar and Occult Tools items. They issued errors. That an old version of Occult was installed. Huh? That didn't make sense. Oops. Discovered the Occult Watcher group. And I was already in it. Thought it rang a bell. Whoa! SkyNews magazine showed up. Rhonda brought it in. That seemed fast or early! 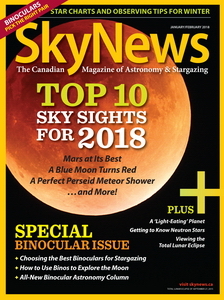 Perhaps it is because the issue is featuring the astronomical highlights for 2018. It looks like next year will feature good Mars viewing, a special lunar eclipse, and a perfect opportunity (i.e. no Moon) to view the Perseid meteor shower. Yeh! The current issue also discusses binos and how to choose the best ones for astronomy. A new column accompanies this topic: binocular observing. There's an article called Image-processing Basics by Mr Puerzer. Hopefully I can learn some tricks. I still struggle with this. The Jan-Feb 2018 issue also features a solar eclipse shot by Mr Park. Congrats! Tried adding the Lunar Occultations add-in to Occult Watcher. It needs Occult installed but I kept misreading the notes. Installed Occult Tools add-in to Watcher. It needed the Occult software. I finally realised what was going on. Downloaded and installed Occult 4.5. Tried running the configuration commands for the two add-ins but they kept reporting I needed version 4.0 or higher of Occult. Huh? Applied the update to Occult Watcher. From 3.9 to 4.5. Now I can watch for lunar occultations of close double stars! Tested a special release of SkyTools 3 for Greg. We're trying to sort out some SSL issues. Clear. For a change. They were going ahead with the City Star Party at Bayview Village Park. Saw a couple of stars as we drove north. I stood briefly by the front porch and looked at Cygnus and Lyra. Too tired to set up. I stumbled across this some time ago, don't remember when. 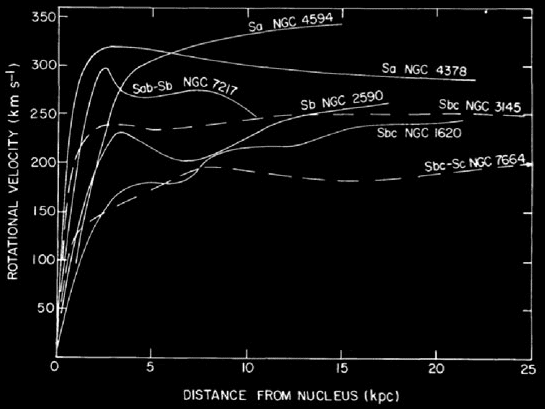 But I wanted to share it as it is the most realistic presentation of star colour I have seen in the classic Hertzsprung-Russell Diagram. The blues and oranges are pale. The colours are subtle. And this is how we see the colours of stars in the telescope. Or in photographs that are not oversatured. From Bruce MacEvoy's web page Astronomical Files from Black Oak Observatory. Such as amazing resource. 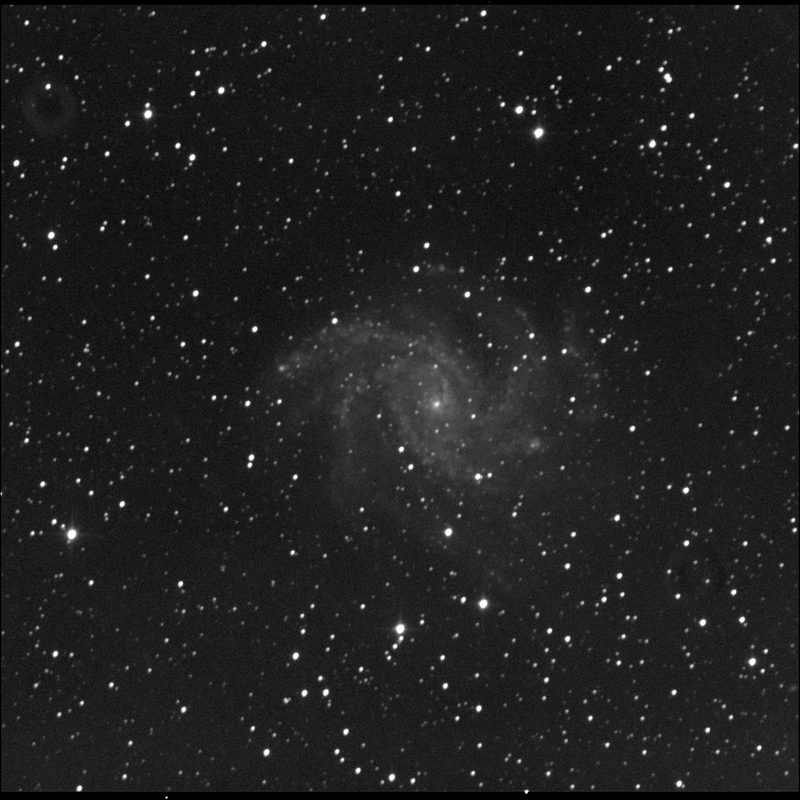 BGO imaged the supernova SN2017eaw once again. Hanging in there. Still around magnitude 17. Recently decreased the minimum height requirement for the Fireworks Galaxy. Image quality may begin to degrade. Been a while since I've had a look. Last shot on 11 Nov. It was a very nice sky to the west, with only a few clouds, as I drove up the 410. Noticed the Moon up high when I made a quick launch. I looked for planets through furtive glances. Nope. Had hoped to see Saturn and Mercury. As the highway curved west, I had a good look. Nothing. Too late, perhaps. Saw a planet is a clear pre-dawn sky. It seemed faint. So could not have been Venus. It did not seem to have an orange or red hue. So it was likely not Mars. 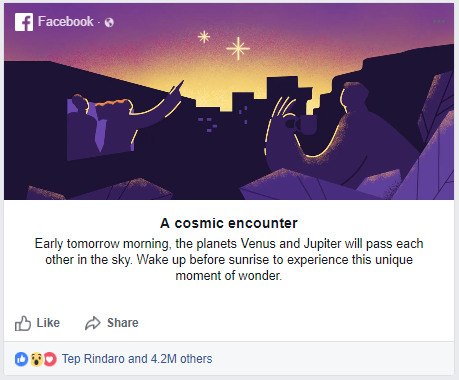 Was it Jupiter? Or Spica? I noticed in SkyTools that Hickson 1, the first object in the Hickson Compact Groups was up high. 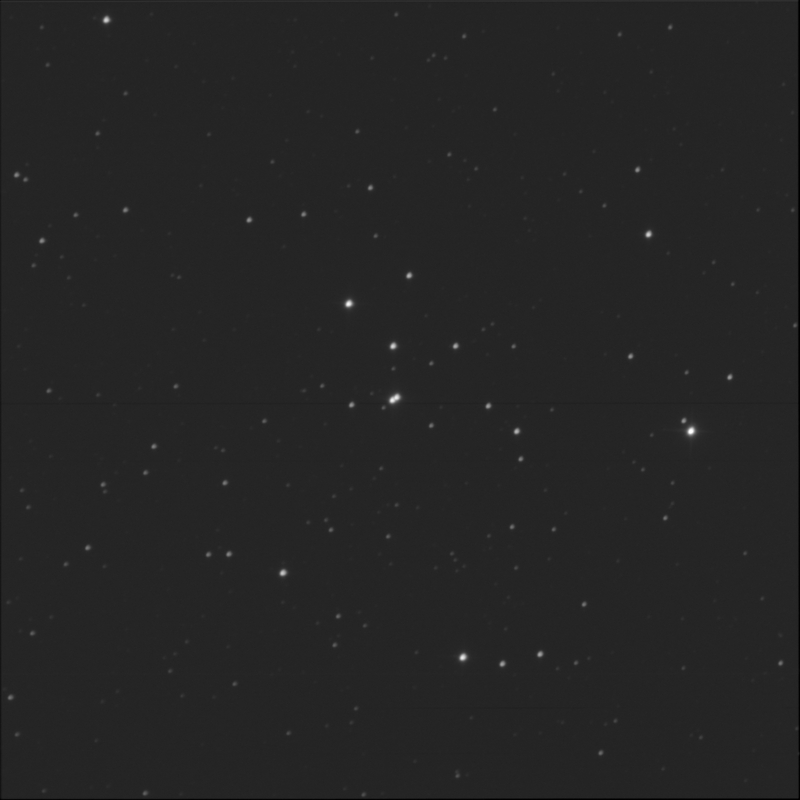 Programmed the Burke-Gaffney Observatory to image it (centring on Tycho 1734 01060 1). The documented members in UGC 248, PGC 1625, PGC 1614, and PGC 1618. 248 is the large member to the north-east. It is touching 1625 to the south-west. Both of these look like spiral galaxies interacting, tearing each other apart. There is a very interesting bridge between them. They are east of the Tycho star. 1614 is to the west. Round. With a bright core. West of the Tycho star. 1618 is the very tiny faint round fuzzy between the others. Between Tycho 1734 01060 1 and Tycho 1734 00524 1. South-east of the cluster proper is a bright but small almond: PGC 1628. Made a new SkyTools list using the data from the popular Coldfield Observatory double star list. It contains 200 beautiful double and multi-star systems. I had to review the steps as I was a little rusty but I was able to import a "cleaned" list and then manually match up all the targets. Tried to put on the new SkyTools forums but it is not configured to accept STX files... Sent to Greg for vetting. He put it on the Skyhound server for download and encouraged me to promote it on the new forums. Looks like a neat list. While the power was out for a few hours, I noticed that the new "street" light was burning. This was the new light, at the top of the walkway, Rhonda had pointed out to me some time ago and that we walked under, triggering the sensor, on 19 Nov. It continued to operate during the outage. That made me wonder if it was battery powered and recharged with a solar panel. I checked how much this light my intrude into the backyard. I can see it from certain spots unfortunately. When the power came back on, I showed Rhonda the short video of a spiral galaxy spinning. She concurred. There's a strong impression of water running down a drain. Wish I knew how to make a video loop on YouTube. Explained that the galaxy on the left is spinning at an expected rate, with speeds tailing off the further we are from the centre; the right spiral portrays the observed speeds, where the outer arms are travelling faster than expected. Did some testing with the LogiTech 5700 web cam to see it might work as a polar scope camera. Cut the bottom out of an old (translucent) plastic film container. Quickly attached it to the camera body (with tape) trying to keep it fairly well aligned. Attached the USB connector to John Repeat Dance. Launched Paint and chose the capture command. We have a picture! All right. But could not control the camera. Installed the assembly onto the Celestron/Vixen polar axis scope. Could see the reticule pattern. Yes! Tested focusing. It worked. The shaft was clearly too long. Cut down the film tube, removing about 1 cm. This put the camera very near the ocular. Shaft length is about 3.3 cm. Tried Microsoft AMcap version 8.x and it worked nicely. Was able to control the output video frame size. 640x480. Manually focused the camera. I suspect the oblong shape is due to the misalignment. Once again, in 123D, I made a replacement part for the Vixen Super Polaris mount. 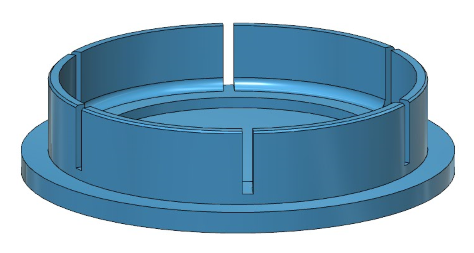 This time, I designed the polar scope cover for the rear of the mount. But I suspect it will be a big job. 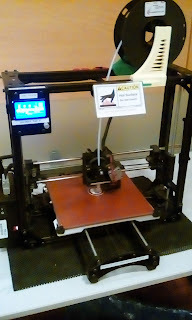 On TPL printers, it will likely take too long, as the part is large. I'm going to have to figure out a solution for actually producing large items. I have been describing galaxy rotation incorrectly for some time. I retract the remark that galaxies are acting like rigid wheels. I would describe the motion of the stars at the outer edge of a spiral galaxy being faster than stars in the middle and faster still than the inside stars. Like spokes on a wheel. My apologies for confusion caused. I misinterpreted information about galactic rotation. In fact, as measured by Vera Rubins, the inner stars are moving slowly (say 50 km/s). The stars further out are moving faster (100 km/s). The stars further out are going faster still (maybe 200 to 300 km/s). And then the speed curve flattens. The stars in the middle and outer limits are going this same speed (200 to 300 km/s). I was mistakenly continuing to ramp up the speed, the further we went out. Given the stars in the outer spiral arms have a greater distance to travel and their speed is the same at ones in the middle, they fall behind! This consequently explains something for me: the twisting or torquing effect. Which I could not resolve with the rigid disc approach. All this revealed itself to me as Rhonda and I talked about types of objects in the galaxy, where they were located, how they contributed to the formation of the galaxy, and so on. Rhonda asked me if our solar system plane (the ecliptic) was at the same angle as the plane of the galaxy. Nope. I knew it wasn't. But I had to look it up. Which makes sense! When you factor in the tilt of the Earth to the ecliptic, that puts the galaxy at nearly 90. That's why are certain times of the year, the Milky Way goes straight overhead. I also said that for all other systems, it would be random. Every exosolar system would be different. Ron's talk at last week's meeting was intriguing to Rhonda. But I offered to present the types of celestial objects against a galactic oriented map as opposed to what he did, showing them in maps that followed the equatorial grid (which is an extension of the Earth's terrestrial grid). The sinusoidal line of the galaxy threw her. It just makes sense to me that we take a view most like how we see the galaxy when we look up. I recalled that the old application Where Is M13? supported a "Sky View" cylindrical projection chart with the plane of our home galaxy flat, along the horizontal. Fired it up. The horizontal line in the middle, at 0 degrees, shows the plane of the galaxy and alludes to the location of the main disc and the Milky Way's spiral arms. The vertical line indicates where the centre of the galaxy is, the galactic core, and the suspected bar of our spiral. 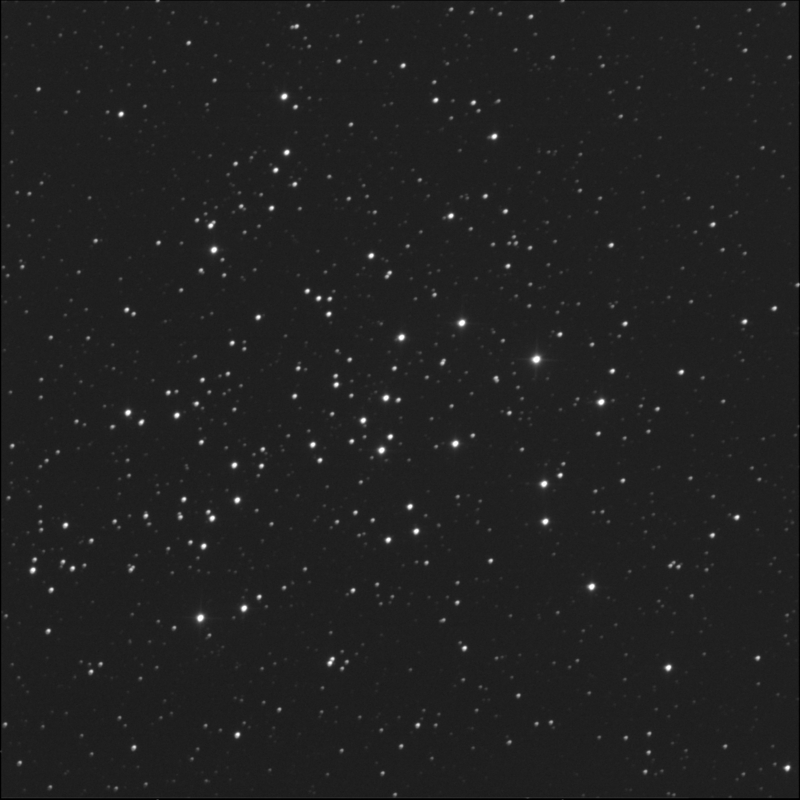 Above is the built-in "all globular clusters" preset filter. You can see the orange circles are buzzing around the hub of the galaxy with some well above and below the plane of the Milky Way. They are old structures, perhaps important in the formation of a spiral galaxy. 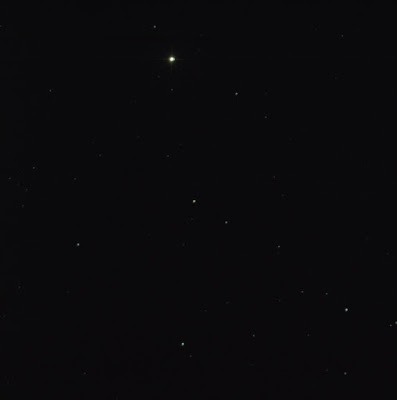 I made a custom filter for the "diffuse nebulae" to show the dust and gas that may be the fuel for new star systems. The green squares follow along the arms of the galaxy. There is a big void around Aquila. Chose the built-in preset for "all open clusters." It is very clear how tight they are to the arms of the galaxy. Note the obvious gap around Aquila. The big yellow disc is Collinder 285 aka the Ursa Major Moving Group. I believe our Sun is considered a member. Again, I made a custom filter. 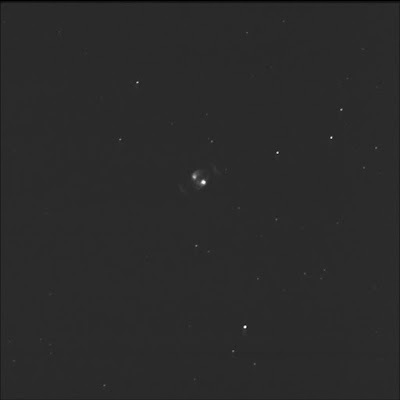 This one shows the planetary nebulae. Not surprisingly, the blue marks are fairly in-line with the arms. The ones above and below are likely close to us. I found an interesting filter, the "OB associations." Ron did not address these. These are regions of hot, young stars, living life fast. They tend to go out in spectacular fashion, as supernovae, starting the whole cycle again. The stippled patterns, you can see, are in the arms. And all around us. Except in Aquila. The BGO reported a partial observation. Sounds like it was able to squeeze in a few images before clouds rolled in. Not much better than the run on 14 Oct. I had requested NGC 541 in Cetus. A galaxy within a group that appears to be known as Minkowski's Object. Two of the colour channels were not gathered. There's a satellite in this image. There's a bad gradient. But I don't really care. I just imaged this region for fun. NGC 541 is the oval fuzzy, with the bright core, left of centre. aka Arp 133. North-north-west of 541 is a tiny round lint ball: LEDA 1121627. Right or west of 1121627 is another tiny faint round fuzzy: LEDA 1121698. 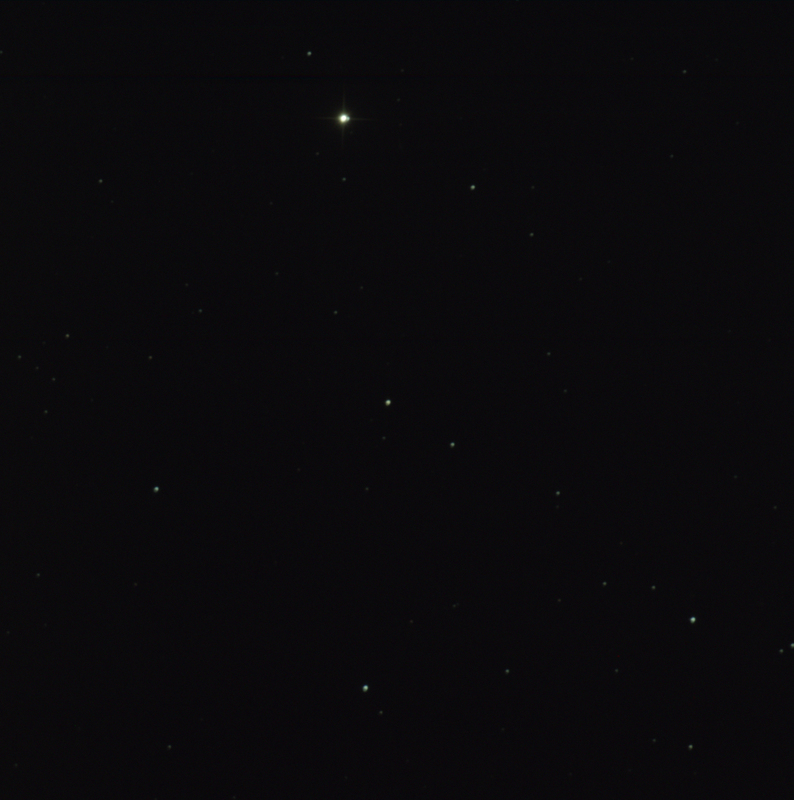 LEDA 1120269 is due west of 541, quite a distance away. Also tiny and round and faint. Between 541 and 1120269 is LEDA 73954. It is a bit larger and brighter than the LEDA. South-west of 541 is an edge-on galaxy. Doesn't look like a classic spiral. 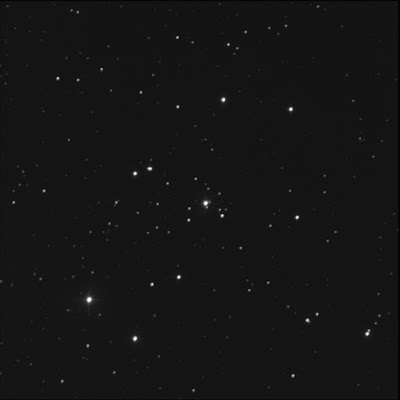 SkyTools 3 Pro says NGC 535 is a lenticular. Much further, near the bottom-right of the frame, is another object that looks identical to 535: MCG 0-4-121. It's rotated 90 degrees. A bit to the south of these is a larger lenticular: MCG 0-4-129. East of 0-4-129 is UGC 996. It looks similar albeit a bit smaller. Oriented east-west. South of these two, between them, is a slightly larger spiral. 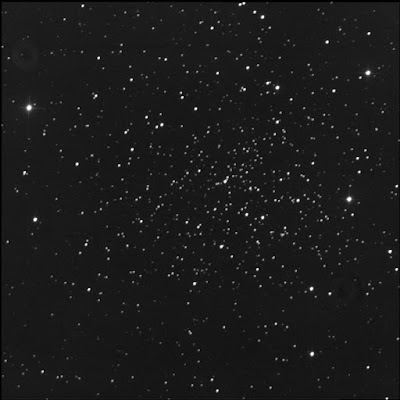 NGC 538. Due south of 541 is an almond shape with a bright core: UGC 1003. South-east of 1003 is a round fuzzy. This is PGC 5306. 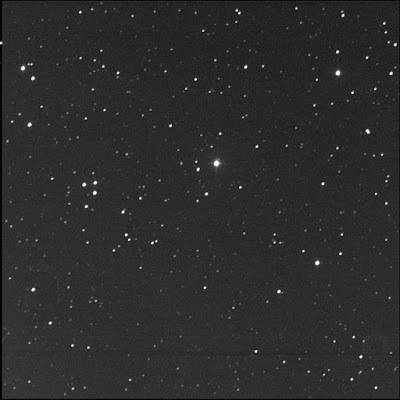 LEDA 1119267 is close to 541, to the south-east. It is very faint. Due east of 541 is a tiny oval. LEDA 86298. North-east of 541 is the pair of large galaxies, NGC 545 (north) and NGC 547. Together they are Arp 308. They look like classic elliptical galaxies. Bright! North-east of these two is a small oval shape: LEDA 169816. East of the twin stars is MCG 0-4-140. A small elongated fuzzy with a bright centre. North of the twins is a bright round ball of light: NGC 543. Wow. Lots happening in this area. Andrew published the final version of The Sky This Month video presentation which I delivered on Wed 15 Nov. This version has my updated slide elements. I was looking for star charts which presented the Milky Way galaxy "flat" or a chart that was oriented in the galactic perspective. Found a cool map. When I revisited the page (called Commentary on Star Atlas in Galactic Perspective) and read the entire article (with references back to the Apollo missions), I stumbled across his hand-drawn Local Meridian Finder figure. Wow! This is very useful as a quick and easy low bandwidth tool for predicting visibility. 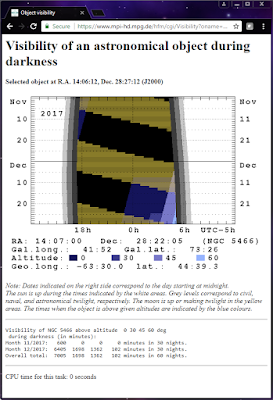 For example, the graphic says that on 20 Nov at midnight, objects between RA 3 and 5 will be well placed. Shared on the RASC forum. Sent a link to Rhonda. A "flattened" map of the Milky Way galaxy. It presents our galaxy view with little distortion, which is rather helpful I think when trying to understand where things are. She liked it a lot. Chart from the Shade Tree Physics web site by Robert Fritzius on a page called Commentary on Star Atlas in Galactic Perspective. Used with permission. 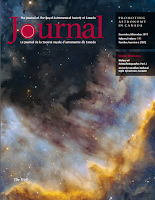 Read an article at Astronomy Now. I was happy to learn that the Arecibo Observatory will keep scanning the skies. It escaped significant damage from Hurricane Maria. And now the National Science Foundation is planning to continue its support of the facility. You could also add (or subtract) twelve hours to (from) the desired object's R.A. and then adjust the date to place the sun at the calculated R.A... Then revert to night time and adjust the hour to put the object on the meridian. Ah. Is it that simple? By adding (or subtracting) 12 hours against the target RA, it puts the Sun opposite the target. And then the target will be high in the night sky. This gets it near the meridian at midnight. Not knowing the sky, in my head, in terms of celestial coordinates, I would still have to use software. 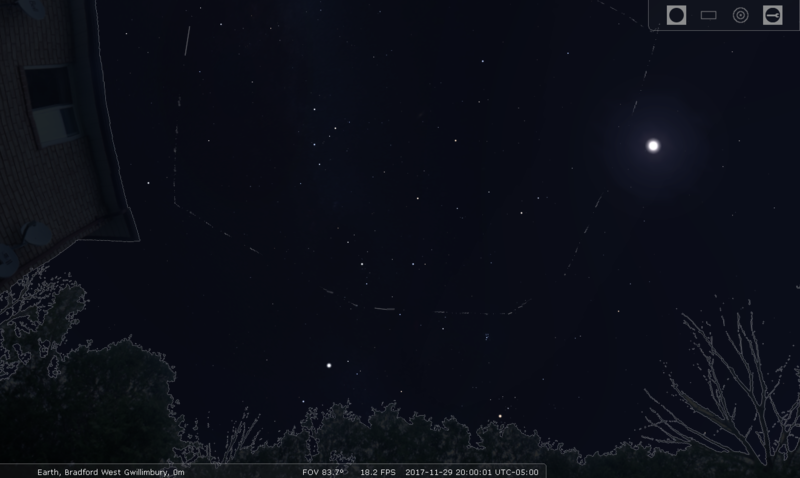 And if you fire up Stellarium to do all this, then, well... you can just go to the object and figure it out that way... If Nick is after a calculation he can do in his head or do on a scrap of paper, I'm not sure it is possible now. Grabbed the Vixen Super Polaris mount. Installed the new cap. It fit! Amazing. When I bought this mount on consignment many years ago, at the time, I did not know it was missing many pieces. Like the fore and aft polar axis scope caps. Slowly, I'm getting it back to its original state. Rhonda and I chatted on the way home. She enjoyed the evening. Learned lots from the presenters. She particularly liked Ron's talk on the Milky Way and spiral arms of galaxies. I wondered about viewing the charts though a different way, with the galaxy plane flat—I think it might be more powerful that way. It freaks me out a little bit. This little plastic object did not exist in the world a few hours ago. The cap I made for my Vixen SP mount I drew in computer 3D software, copied to a memory card, converted to print code, loaded into a 3D printer, which extruded white PLA in the appropriate pattern. I showed my new prized possession to Peter H. He said they too use 3-dimensional printing, for their electronic equipment projects. Showed Rhonda. She was excited for me. Showed the gang at dinner. I thank Chris V for spotting it all the table as we were leaving. That would have been heart-breaking if I had immediately lost it. For the first time, in my TSTM presentation, I promoted observing certificate programmes. I deliberately included a number of targets that are in different campaigns. For example, the planets, a comet, features of the Moon, are on the Explore the Universe. There are targets included in RASC Finest NGCs. I referred to a few Messier objects. And there are a couple of Herschel 400 targets. From beginner to advanced. 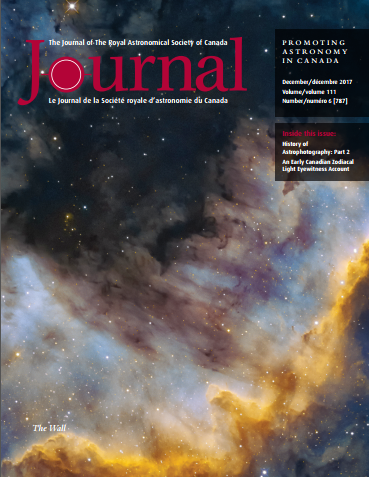 Delivered The Sky This Month presentation at the Ontario Science Centre for the RASC Toronto Centre. The time frame reported on runs from 15 Nov to 13 Dec. The meeting was streamed live; final video will follow soon. My presentation notes were used to form the web page article. As usual, it includes a downloadable month-at-a-glance calendar. 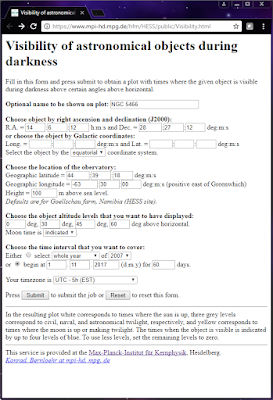 There are observing list files available for SkySafari and SkyTools. New, this time, I made an Excel file. Wore my red LED name badge programmed as "Blake. Space Tour Guide." People liked that. Wore my eclipse t-shirt too. View the captured rough-cut video on YouTube. Sheesh, I look funny. This includes all the speakers in the evening. About 2 hours in length. Updated video online. Just the TSTM. About 30 minutes. Accolades from various members. No, thank you. The International Astronomical Union has reclassified the interstellar asteroid A/2017 U1 to 1I. The digit one indicates it is the first object under this category. The letter i represents the interstellar classification. They also applied a given name, 'Oumuamua. This is a Hawaiian term meaning "scout." The first element ʻOu means "reach out for" and mua, repeated for emphasis​, means the "first, in advance of." Inspected a telescope a member wishes to donate. A 8-inch f/8 Meade LXD55 with its equatorial mount and accessories and custom case. I don't think I've ever seen this particular one before, a Schmidt-Newtonian. Completed my first ever 3D print job. Thanks to the Toronto Public Library staff at the Reference Library for their support and assistance. Produced the telescope part I had designed last night. We struggled with a finicky Ultimaker 2 printer and later switched to their fast LulzBot. Made my polar scope outboard cover for the Vixen Super Polaris mount. The 4-gram piece was completed in about 12 minutes. Printed in white PLA. The original Vixen part was black. OK with me the bright colour. It will be easier to see if (er, when) dropped at night. A little boy with his mom looked in as I started my print job. She asked him to ask me what I was doing. I told him I was making a cap for my telescope because I had lost the original part. His mom liked that story. Learned he has a telescope too. And if he loses any parts, he can make a new one. As I prepared for my TSTM presentation, I wondered about the moons of Uranus. I wondered if it was possible to view them in a graphical way, in a sinusoidal chart like what is shown in the RASC Observer's Handbook, for the moons of Jupiter. Initially, I considered that I could make such a chart myself if I could get the periodic data. On a whim, I conducted a search on the interwebs, and was pleasantly surprised to find the Uranus Moon Tracker tool. Perfect! Pretty easy to use. I made a chart for my TSTM article showing Oberon, Titania, and Ariel. Verified that 10 December will be a particularly good evening. He thanked everyone for their responses. He shared he's been using many of the tools we've already referred him too. And he indicated he's using the "intro" version of SkyTools. I think he means the Starter edition. He also told us about objects he likes looking at. Sue French's Asterisms list, Palomar Globulars, Harvard objects, Abell objects, Jones 1, Klemora 4, Basel 1, Jonckheere 900, ESO galaxies, some red variable stars, etc. Whoa. Some of those are faint. 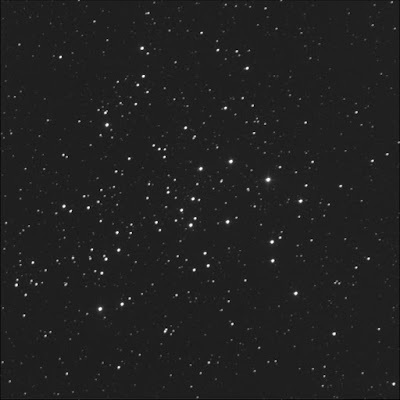 SkyTools Starter edition only includes 4 million stars, down to magnitude 12.5. Nick said that DSO Browser was the best tool for him but doesn't allow the adding of objects. He also said he cannot search by RA & Dec. Oh. He asked again, "What is 'this easy calculation?'" Funny. I was just thinking about it. And Tom posted a notice. The next RASC Toronto Centre Council meeting will be on 21 November. It will be at the St Joan of Arc Church. Skyhound (maker of SkyTools) launched a forum product. They too are migrating away from Yahoo!Groups. After checking with Patrice, Michel, and Richard, James updated the double star supplemental materials with the correction I had suggested on 31 Oct. gamma Cru showed as having SAO number in 239791 but that's for delta Cru. According to various sources, the SAO number should be 240019. My other observations are of little consequence. Sent a follow-up to the RASC TC forums regarding Nick's issue of checking the visibility of objects (after my 8 Nov remarks). 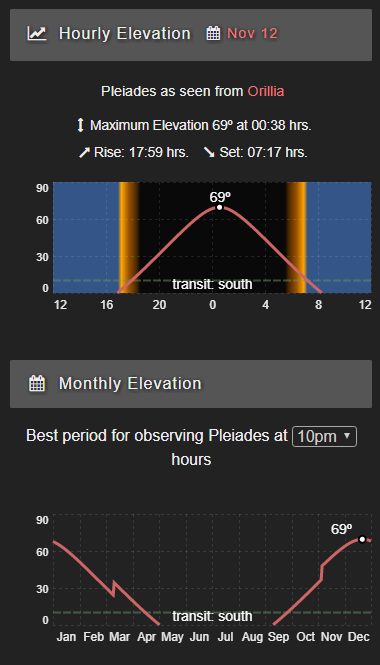 I had popped into DSO Browser to check something on one of my astrophotos and I spotted the elevation graphs. Similar to SkyTools but online. 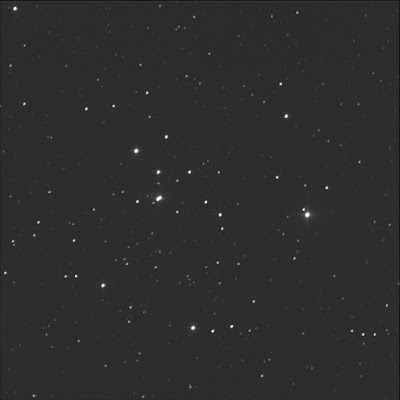 The image shows the data for the Pleiades given the viewing location of Orillia. The first helps verify the best time to view or shoot in an evening; the second tells you when the item is best viewed in the year. 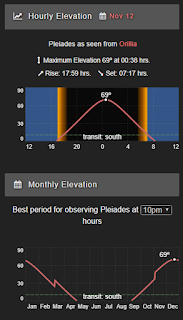 It lets you adjust the observing time in the Monthly Elevation chart which is cool. SkyTools does too—I've never used the feature before. I still like the SkyTools YearBar better. A subtle thing is that it includes the moonlighting. From the graph above, we can glean that Pleiades is best in the winter, high in the sky in November, December, and January. For the example date shown, Nov 12, it crosses the meridian around midnight. For 2017, that's OK as there's little moonlight; but in 2018, the sky will be washed out with the stoopid Moon. Another member referred to a "simple calculation" to locate objects but did not expand. Orbital ATK got away this morning. They, returning to flight on a new rocket, are on their way to the International Space Station with supplies and science. The space truck was christened S.S. Gene Cernan. Apropos. Details at SpaceFlightNow. About a year ago (20 Dec '16), I imaged Messier 47 and the double stars within. At the time, I was not able to split V378 Pup AB. Wanted to have another go. Luminance only, 2 seconds subexposures, 20 stacked shots. FITS Liberator, GIMP. North is up; east is left. Unfortunately, I still cannot split A and B. Tried a 1 second shot on 30 Nov. 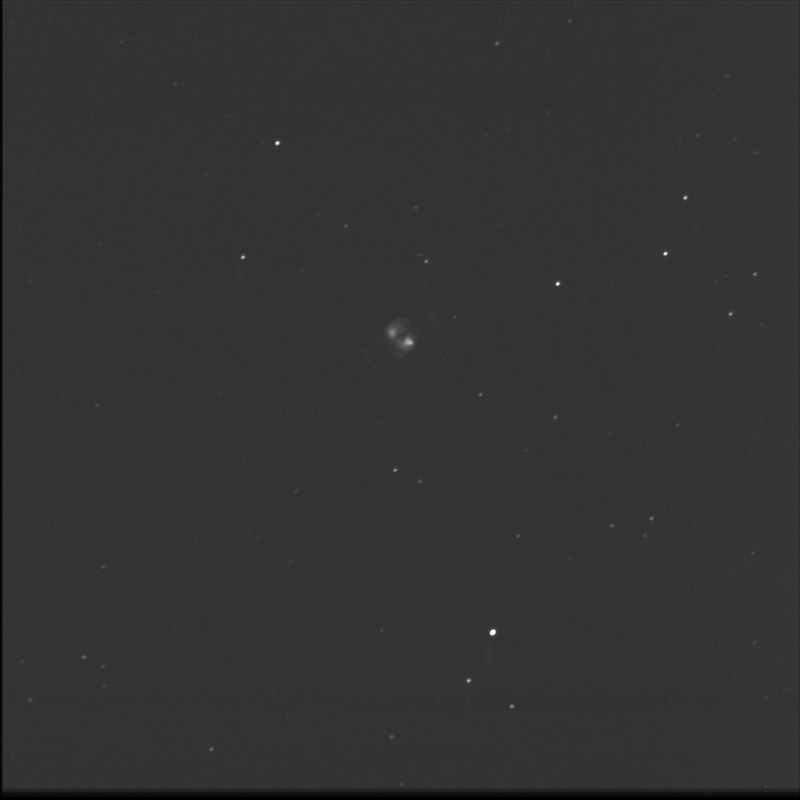 Needed to revisit NGC 1528 with BGO. Something went terribly wrong on 11 Sep '17. A very good result this time. I also dropped the exposure time a bit. Luminance only, 20 seconds subexposures, 10 stacked shots. FITS Liberator, GIMP. North is up; east is left. For the first time I grabbed the sky sensor data captured at the Burke-Gaffney Observatory. I missed the memo about this new device (a Boltwood Cloud Sensor II) and the web page showing the daily, weekly, and monthly charts. The charts show the cloud cover with the green bars. The higher the green level the better the sky, i.e. it is clear. The value 40 is the maximum. A low value like 20 indicates very cloudy. The blue line on the chart shows the difference between the air temperature (nominal values, like 6°C) and the sky temperature (usually very close). High numbers suggest clear skies. 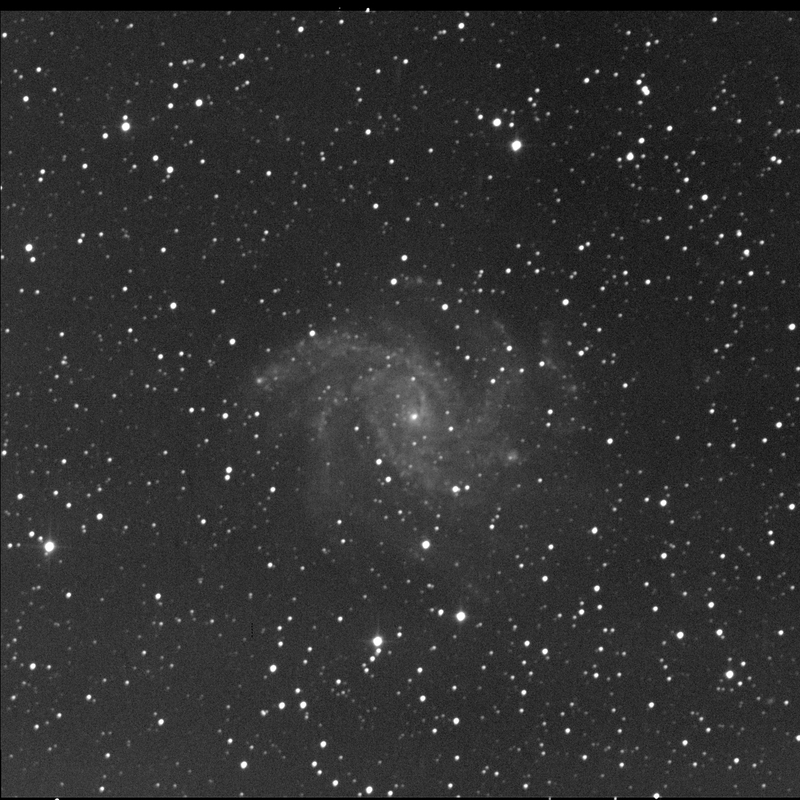 For fun, I charged the Burke-Gaffney Observatory with imaging the group of galaxies around NGC 7619 in Pegasus. This is an interesting group of galaxies and I can't help but wonder if it is part of a formal group. SkyTools 3 Pro shows that NGC 7619 is west of ACO or Abell 2594. Is it part of it? 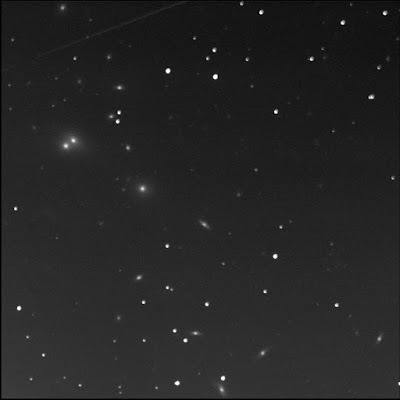 To the north-west, well away, near the top-right of the photograph, is LEDA 1344694. It is just a little bit north-east of the bright pair of stars. It looks like a distant canted spiral galaxy. Still north-west but closer is a very dim round patch. LEDA 142907 is just below the faint star J231948.8+081639. Nearby, to the south-south-west, is a small almond shape. LEDA 1342934. To the west of these two dim objects is the rather large but faint galaxy UGC 12510 aka PGC 71085. I don't see a spiral arm structure; perhaps it is an elliptical. Close the NGC 7619, to the west-north-west, I see a faint fuzzy. Below star J231959.2+081401. It is not tagged in ST3P. LEDA 197669 is nearly due west. It is medium-sized and bright. Nearly perfectly round. Far away to the south-west is the long streak of LEDA 214939. 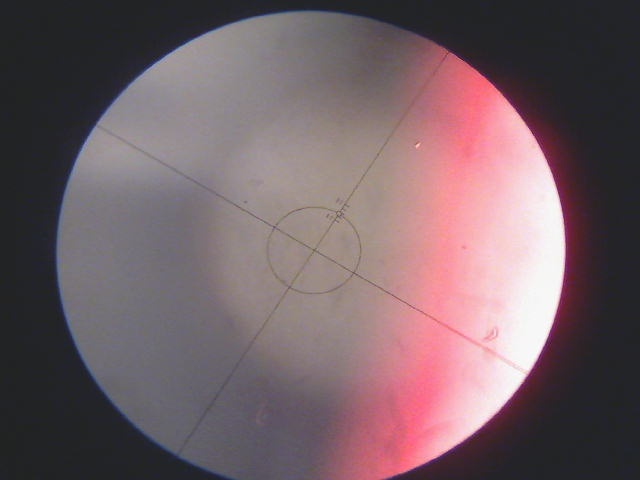 It looks to be a edge-on spiral but does not show any brightness at the core. 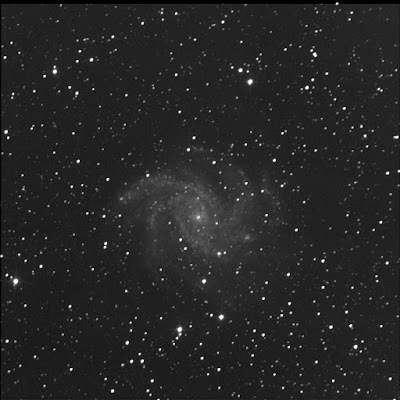 Unlike NGC 7611 to the south. A smooth large oval with a very bright central region. 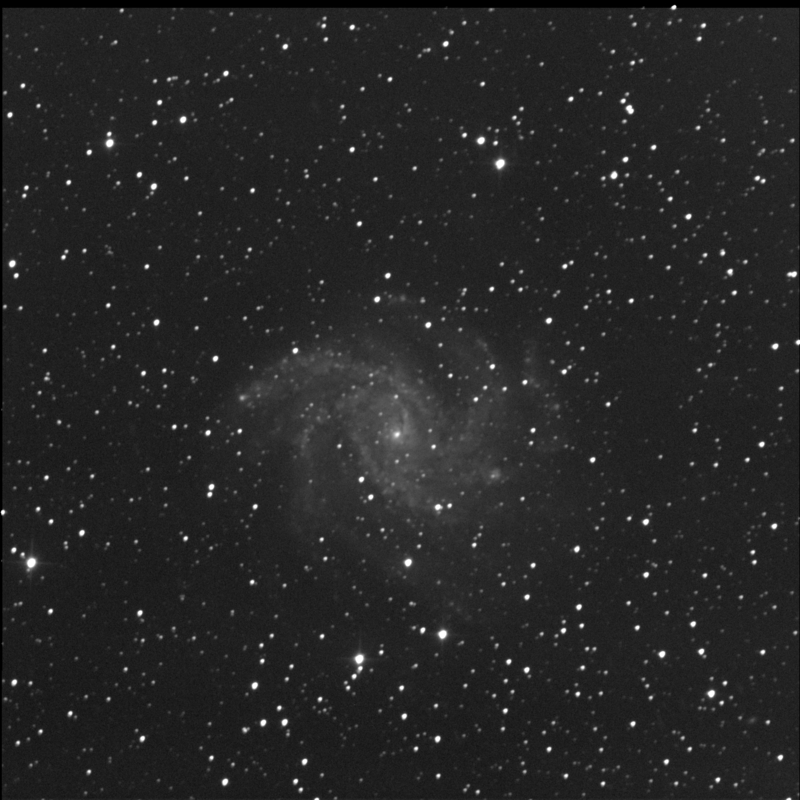 Near 7619 is NGC 7617. To the south-west. The outer edges of this galaxy are very dim; the core is very intense. MCG 1-59-54 is due south of 7619. It is barely visible at the bottom edge of the photo. It appears as a large but dim face-on spiral. 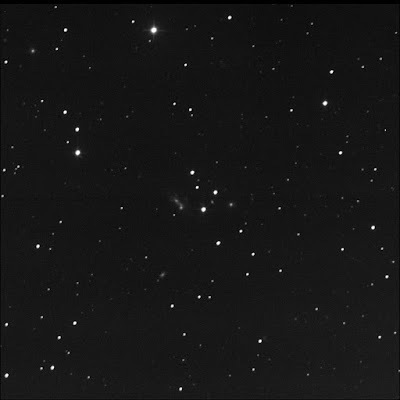 NGC 7626, to the east of 7619, appears almost identical. Elliptical, bright, about the same size. 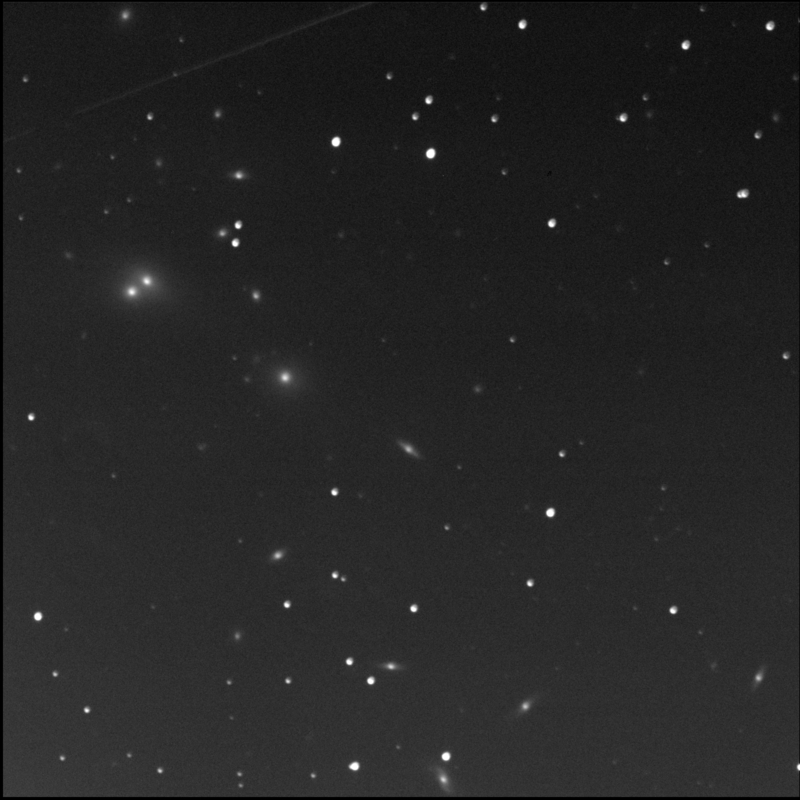 Tiny LEDA 3097931 is visible just a bit north of 7626. At the far north, at the edge of the frame, is the round fuzzy of LEDA 1344674.
which shifted the mount (positive) 10% in R.A. and negative 10% in Dec. 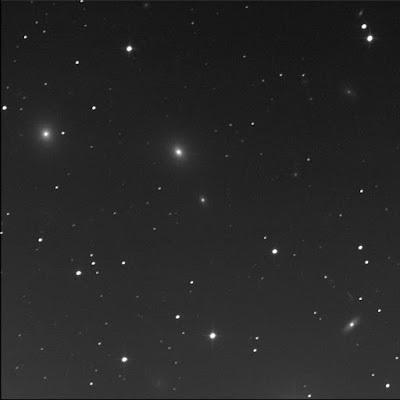 The end result appear with the centre of the image down and right or west and south of 7619. 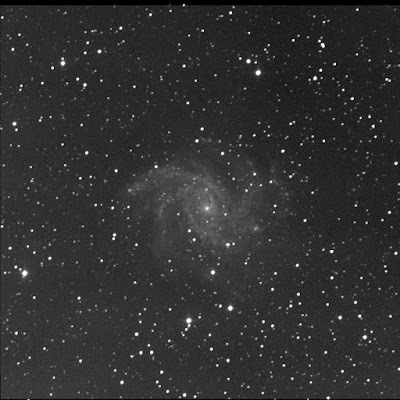 I did this primarily to include NGC 7611 at the bottom-right. Wait a sec'. Isn't R.A. decreasing? I sent the Halifax robot to the Fireworks galaxy once again. Slow burn that supernova, SN2017eaw. Still slightly brighter than magnitude 17.0. Last shot on 4 Nov '17. Now Facebook is reminding me about astronomical events... Appulses, no less. Huh. The only problem is that we'll have to get up stoopid-early to take it in. That might be a deal-breaker. First shot on 17 Jan '17 when I was trying to capture the bright open cluster NGC 2244 (within the Rosette). At 30 seconds, many of the bright stars were flat-topped. Learned of the multi-star system HD 46150 aka SAO 114010 but many of the components were merged. So I ordered BGO to expose for a 1/3rd of the time. Luminance only, 10 seconds subexposures, 20 stacked shots. FITS Liberator, Paint.NET. North is up; east is left. Dim B is visible very close to the primary to the north-east, near the 11 o'clock position. C is slightly brighter than B. It is to the north-west (around the 1:30 position). Perhaps a titch closer than B. These two elements I had put on a "view again" status. Tagged! D is brighter still, to the west-north-west or 2 o'clock. E is easy, brighter again, to the south-south-west or 5:30. A, B, C, D, and E were lost in the glare or merged in the 30 second shot. In addition, I had thought that the B had moved. In this image, it is clearly in a different position than indicated by SkyTools 3 Pro. Also, quadruple system HD 46056 is more clearly resolved. As is triple HD 46180. Processed HR 6043 in full colour using the LRGB data gathered on 17 Oct. A little challenging, this one. It's subtle. Luminance 4x20, RGB 4x10 each. FITS Liberator. Photoshop CS2. The primary (and field stars) look beige or white; the B companion looks blue! Nice. Aimed BGO at star GSC 1849-1566 not sure quite what I would get. This is the location of TCP J05074264+2447555, a new transient (10.8 mag) in Taurus reported by the AAVSO as a microlensing event. Huh. OK. Let's try it, I thought. Luminance only, 15 seconds subexposures, 10 stacked shots. FITS Liberator, Paint.NET. North is up; east is left. The target object is south-south-east of the bright star (HD 32922, at mag 8.8). If I had to guess, compared to nearby stars, I put it at mag 14 now. When I first heard about this (via a Facebook post, I believe), I imagined seeing an effect like the Einstein Cross. What's happening with this object is that a star's light is being amplified by gravitational lensing; it is not being split. 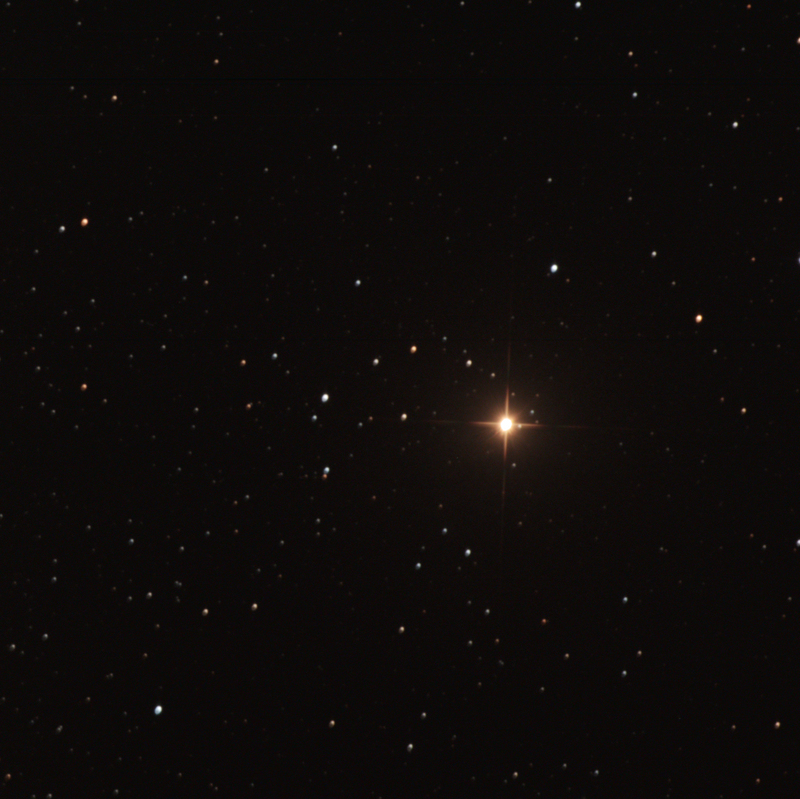 I believe this star, also known as J050742.7+244756, normally shines at magnitude 14. 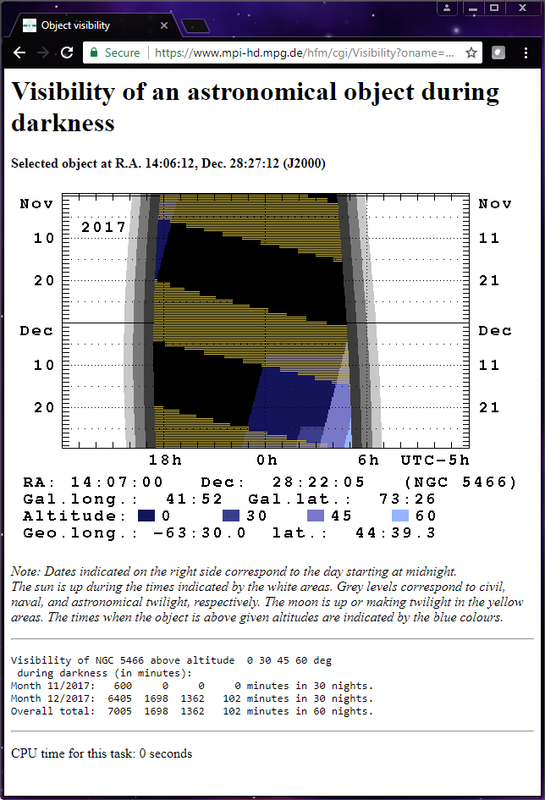 It was reported as bright as mag 10 or 12 (in V and R filters) as recently as 4 Nov.
See the time-sensitive alert page provided by the American Association of Variable Star Observers. 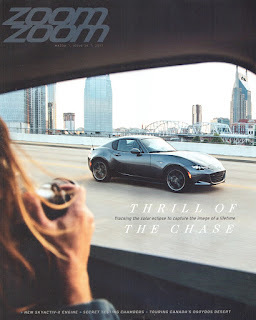 In the discover's image, it looks brighter than mag 12. See the Followup Reports page provided by the Central Bureau for Astronomical Telegrams. POU 552, in fact, is a triple, east of HD 32922. The B companion is very near the primary, south I think. The C attendant is north of A. They are all roughly the same intensity. Well away to the south-east are a bunch of pairs but the only one identified in SkyTools 3 Pro is POU 555. B is fairly close, to the south-west, and slightly dimmer. 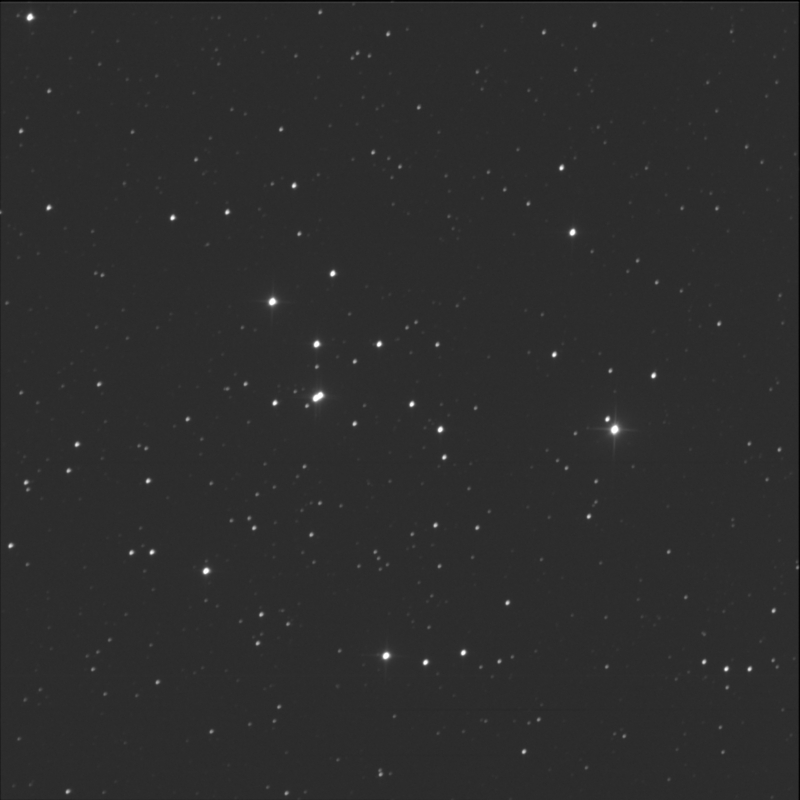 A couple of days ago, Nick posted on the RASC TC forum that he was looking for the maths or an online tool to help determine the visibility of a object in the night sky. The first member that jumped in talked about using planetarium software. He focused on planets (not sure why) and their opposition times. He also mentioned that The Sky This Month (TSTM) talks at RASC meetings reminded attendees of visible constellations for the time period. Another member suggested SkyTools. Didn't mention the free version, trial versions, or the cost for the Standard or Pro editions. I suggested the online calculator at Max-Planck-Institut für Kernphysik (MPIK). I did provide a caution: The drop-down for dates stops at 2012 but in the date controls below you can specify the start (d, m, y) and duration. 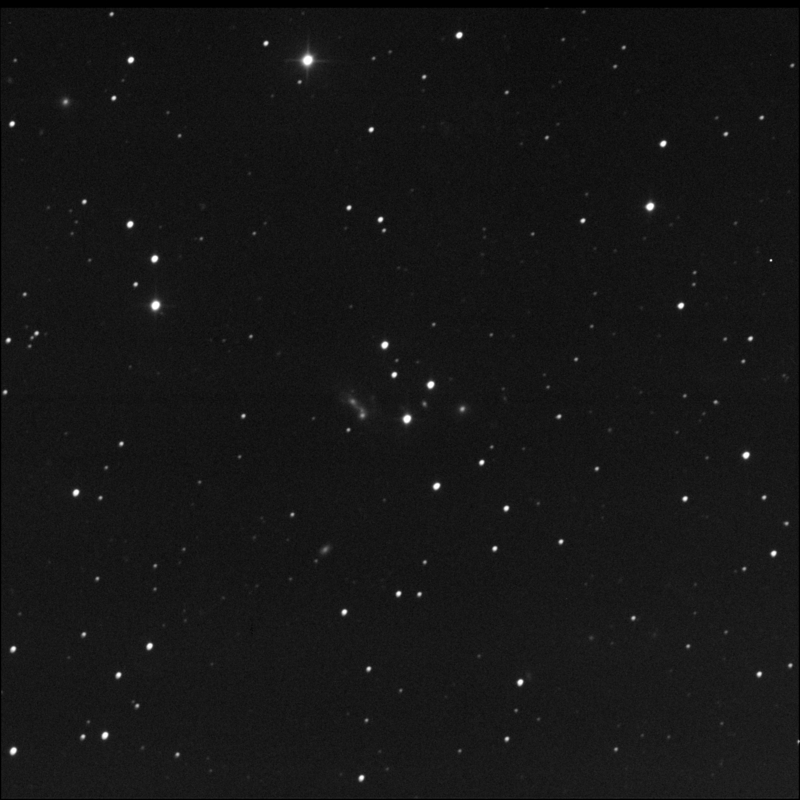 I did a test with NGC 5466 from Halifax. It works really well. Great for one-off searches. I assembled the LRGB files for Herschel’s Garnet Star in Cepheus, using the data gathered by BGO on 31 Oct.
Luminance 3x20, RGB 3x10 each. Photoshop CS2. Both B and C, the companions to mu Cep proper, look blue-white. It's interesting reading my first recorded observation (6 Jul '08) and noting the semi-circle of white stars nearby. 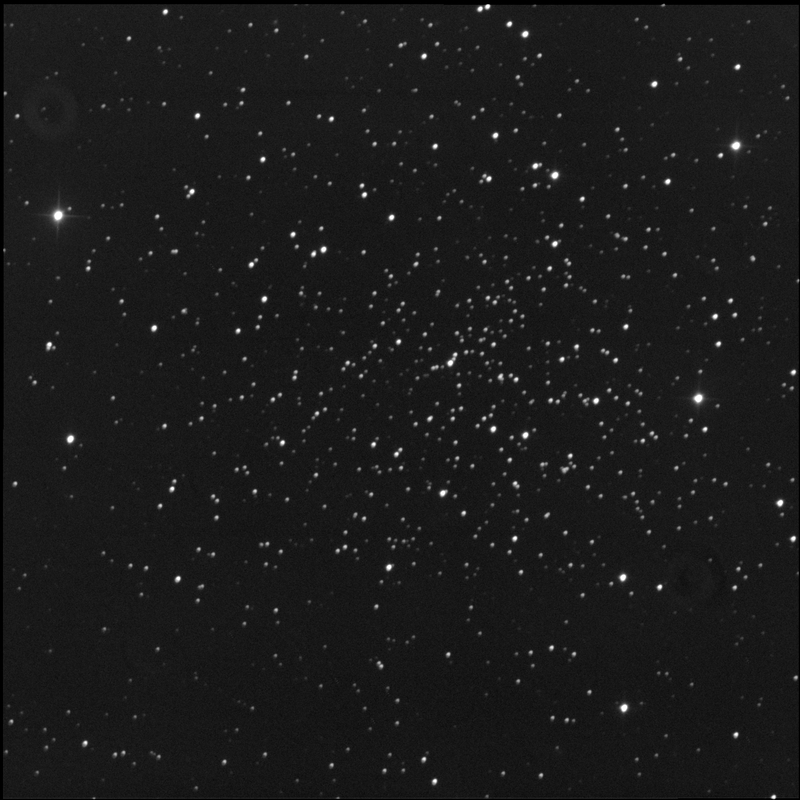 Programmed the Burke-Gaffney Observatory robot to capture NGC 188 aka Caldwell 1, a big, faint open cluster in Cepheus. Supernova SN2017eaw continues to dim at a very slow rate. It looks similar to the shot from 31 Oct.
Found the Hubble Messier catalogue flickr photo album. Oooh. Lovely. This does not include all the Messier objects. And, of the ones shown, in general, they are close up. That is, the field of view of the Hubble Space Telescope is small so we are presented with a tightly zoomed in view or a cropped portion of the object in question. On the other hand, we can see extraordinary detail in galaxies and globular clusters and nebulae. Turn the lights down low. View full screen. 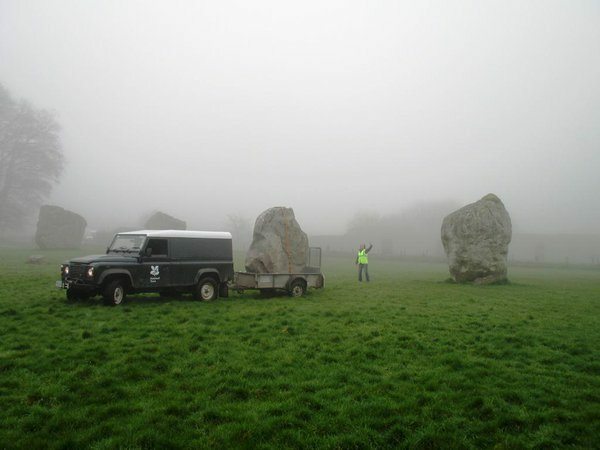 "Another busy night at all the British henge sites as staff work all night to move the stones..."
Pic from imgur spotted on Facebook. I wanted to clarify the matter with the SAO catalogue numbers now used RASC Observer's Handbook for the coloured double stars. list - the list the star is shown in, either in the handbook proper (main) or the downloaded supplemental sheet. ο Dra main 31219 31218 Both stars searchable in SIMBAD. star and 66001 is A. For the most part, where the SAO numbers are different, the other quoted number still gets one in the neighbourhood. In other words, the SAO number refers to another star within the double or multiple star system. And someone using the number in a telescope hand controller or in software should land at the correct location. The entry for gamma Crucis however appeared more severe, referring to a completely different star. I interpreted this as an error and reported it. See the original observation blog post. The OH team corrected the error. 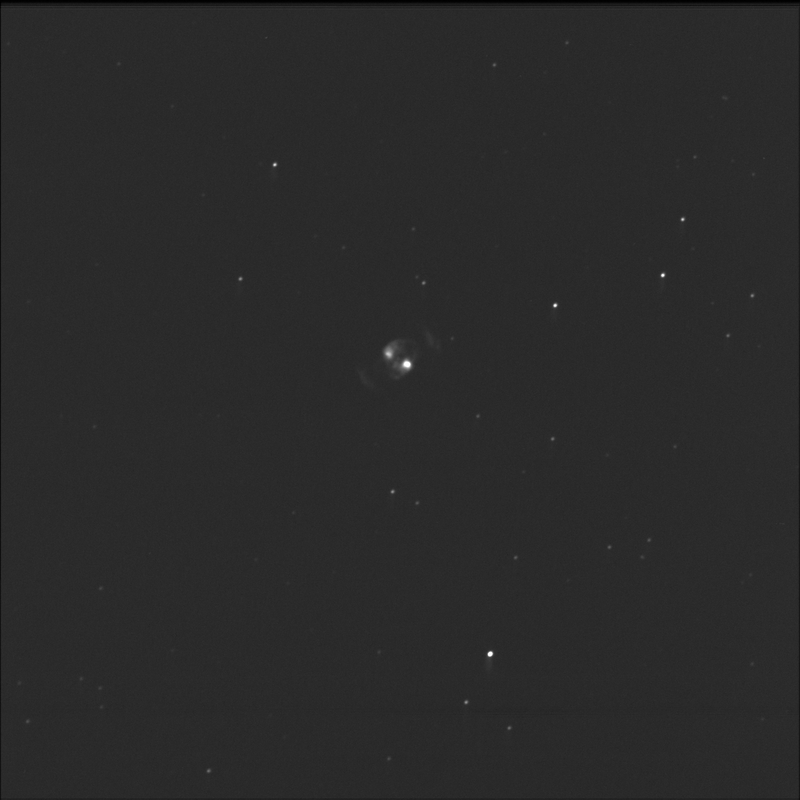 I wanted more data on the planetary Gemini Nebula aka NGC 2371. Sent BGO off. 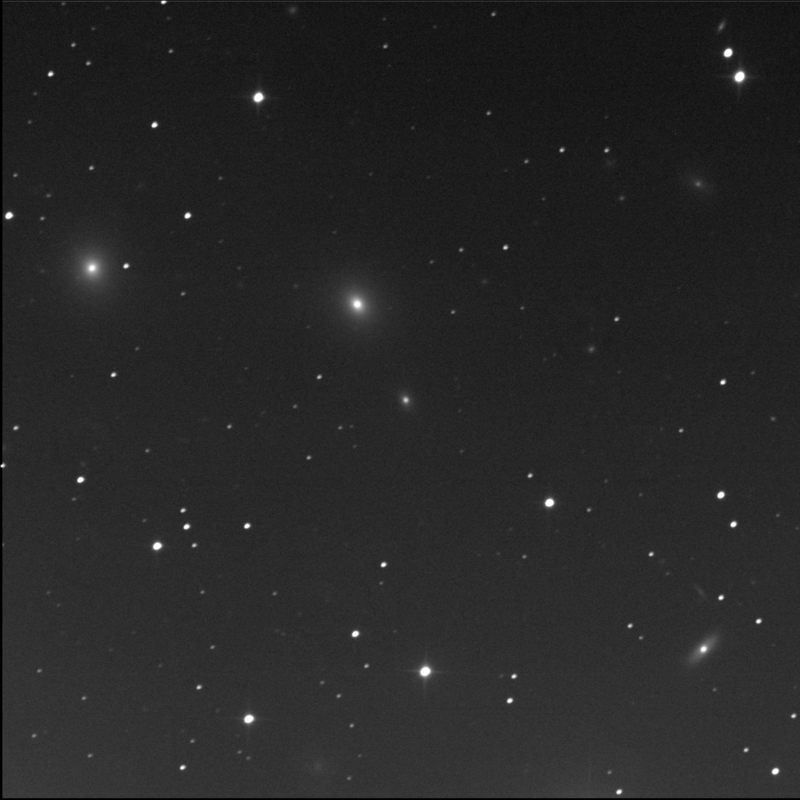 First imaged 27 Apr '16. Ionised oxygen only, 60 seconds subexposures, 10 stacked shots. Bright! Hydrogen alpha only, 60 seconds subexposures, 10 stacked shots. Dim! For all: FITS Liberator, Paint.NET. North is up; east is left.